Compounded with thick, sturdy special long fibers, one stroke is enough to add length and volume. This elongating effect is enhanced by various types of compounded fibers, but does not tangle or clump your lashes. 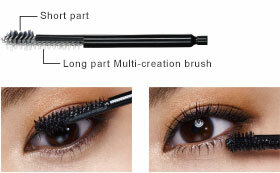 Fiber Mascara that elongates and adds volume with One Stroke. Hold the long part of the brush against the roots of the upper lashes and apply in a brushing motion from the root to the tip.